KBO and American Bird Conservancy are excited to introduce OakBirdPop: a new interactive web application to assist land managers and conservation professionals working on oak restoration projects in the Pacific Northwest. Like other decision support tools, the goal of OakBirdPop is to streamline the process by which research can be used for management. KBO has a suite of decision support tools that present key results from our avian monitoring and research programs in short, user-friendly formats. Click here visit KBO’s collection of decision support tools. What make OakBirdPop different? OakBirdPop is interactive, so managers can see what our bird research and analyses would predict for their specific restoration projects. OakBirdPop allows users to select their region, the bird species they are interested in, and how the oak habitat type will change. The result is a dynamic graph and table that shows how the bird community might change following restoration. Screenshot from OakBirdPop online interactive decision support tool. Seeing how bird species would respond to restoration projects is useful for conservation professionals to know because birds serve as important indicators of ecological conditions. Different bird species will be present in an open oak woodland than in a mixed oak-conifer forest. So if managers know which species of birds to expect in the oak habitat they are trying to restore, they can use birds as a ‘measuring stick’ to determine whether the project met their goals. OakBirdPop makes it easy for managers to see the oak bird-habitat analyses that are most relevant to them, and how birds might fare under alternative habitat change scenarios. Oak Titmouse. (c) 2018 Jim Livaudais. Similar to the Land Manager’s Guide to Bird Habitat and Populations in Oak Ecosystems of the Pacific Northwest, OakBirdPop draws from several years of bird monitoring data to provide density and population estimates for several bird species that may use oak habitats. The hope is that conservation professionals can learn from OakBirdPop, and then collect on-the-ground bird monitoring data to assess restoration success. 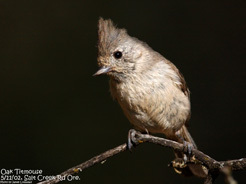 New data may contribute to future versions of OakBirdPop to provide even more information about bird responses to habitat change throughout different regions of the Pacific Northwest. Click here to visit the OakBirdPop online interactive Decision Support Tool.